Once you’ve found the content you’re looking for, you can view that content and make non-permanent changes to it, like filtering the data or changing a time zone. You can view and click on dashboards and Looks without impacting anyone else — unless you choose to edit something, make changes, and then save them. This page explains how to use the dashboard in other ways, such as downloading the dashboard or using the dashboard to start exploring your own related questions. See the Viewing Looks documentation page for a similar rundown on viewing Looks. 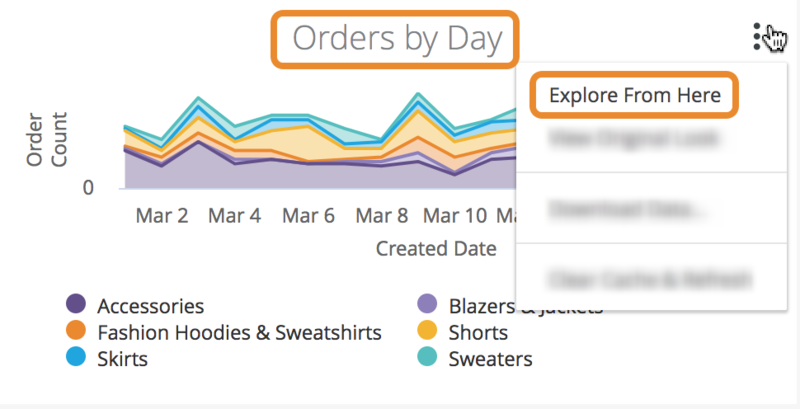 Learn more about browsing and exploring data before starting to edit Looks or edit dashboards. 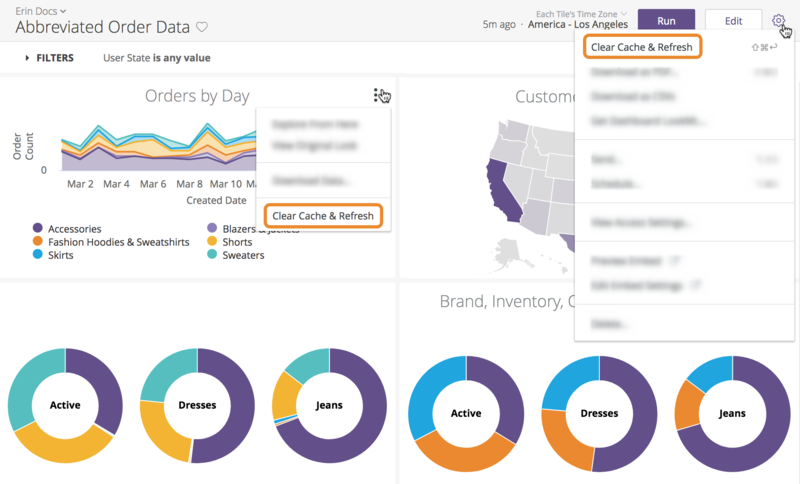 Dashboards can be made up of tiles based on text, saved Looks, or queries specific to that dashboard. To view a dashboard, navigate to the space that contains the dashboard and click on the dashboard’s name (as shown in this section below). To learn more about creating and managing your own dashboard, see our Creating User-Defined Dashboards page. Navigate to the appropriate Space or page. Click the dashboard name to open the dashboard. You can make some types of temporary changes to a dashboard without affecting anyone else, such as changing the time zone. If your dashboard has filters, you can also change the filter values to restrict the dashboard to certain types of data. To save these changes for other users, see the Editing User-Defined Dashboardsdocumentation page. Discover dashboards often have one or more filters that affect one or more of the tiles. You can change a filter to see how the data changes. You will not affect anyone else by changing the filter unless you edit and save the dashboard. In the drop-downs, one of the choices is Matches (Advanced), which enables you to use advanced filtering choices. Any of the time zones listed in the drop-down to have all tiles run in that time zone. Discover dashboards aren’t static snapshots of data from a specific time. Discover dashboards pull data from your live database when you load the page. Typically, Discover has access to the data as fast as the data reaches the database. If you’ve already loaded a dashboard and want to get fresh data, click the gear icon in the upper right and select Clear Cache & Refresh to rerun the queries for all tiles on the dashboard. If you want to refresh a specific dashboard tile, click the three-dot icon and choose Clear Cache & Refresh. Frequently using the Clear Cache & Refresh option on a dashboard with many tiles, or very large reports, can cause a strain on your database. You can check the age of the dashboard’s data to the left of the Run button to see if the refresh is truly needed. Discover lets you schedule periodic delivery of your dashboard to email recipients or to other data destinations. See the Scheduling Data Deliveries documentation page for more information. Discover lets you send a dashboard immediately in an email to yourself or other people, or send the results to another data destination. See the Sending Data Now documentation page for details. 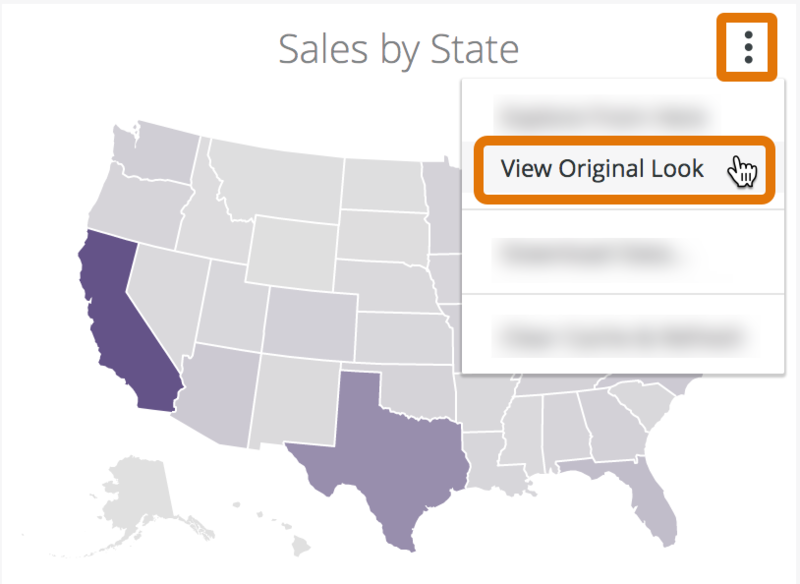 Discover lets you download your dashboard so that you can store or share the current data. You can download the dashboard as a zipped collection of CSV files or as a PDF. Click the gear icon in the upper right-hand corner of the page. Select Download as CSVs to begin the download. If you don’t see the Download as PDF option, check with your IT admin about installing Chromium. Optionally, use the Filename box to change the name of the PDF file. Optionally, expand the Advanced options menu to further customize your PDF. Then check the Single column format box if you want the PDF to show the dashboard tiles in a single vertical column. Leave the box unchecked if you want the PDF to show the tiles as they are arranged in the dashboard. You also have the option to specify the optimal size and orientation of your PDF by selecting from the Paper size drop-down menu. Large visualizations or groups of overlapping dashboard tiles may need to be resized to fit cleanly on a PDF page. If you do not see the Paper size option, talk to your Discover admin about installing Chromium for your Discover instance. See the Downloading Data documentation page for more information about the options available to customize your data download. For dashboard tiles based on merged results queries, you can’t download the data itself, but you can download the dashboard as a PDF or as a collection of CSV files. Once you arrive at the Explore page, you can continue to adjust the query for your particular interest. You also can click or hover on some elements in the dashboard tiles (such as a slice of a pie chart) to view more details about the data. You can learn the skills to explore the details of a dashboard’s data on the exploring data pages. The presence of links or actions are indicated by three periods following the data in a field. When you click on the data in the field, Discover provides an option to open the destination of the link. In the example above, the developers added a link to the Brand column. 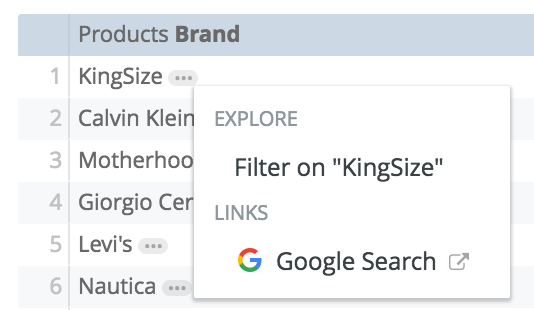 When you click on a brand listing, Discover provides an option to perform a Google search for that brand name. In the example above, the Phone field has a link to the Twilio service. When you click the phone number and select the Twilio action, Twilio prompts you to enter a message. Then Twilio then sends that message to the phone number. When exploring a dashboard, you can navigate to other items within the same Space by using the drop-down in the upper left. Tap a data point on the visualization to show information about that data point. Press and hold a data point to drill into the data behind the data point. Press and drag across the visualization to show information about each data point as you move over them.